Meal prep time shouldn’t fill you with dread. You might be thinking that it has to involve hours of prepping meat and veg and cooking but it can be an easy process. Follow these 5 tips to make your meal prep sessions pain-free and quick to complete. Bulk buying your ingredients is a cost effective way of making sure that you always have enough to hand. Many supermarkets and butchers run deals that allow you to get a good few items for a great price. To prevent food waste make sure to freeze what you’re not going to use before its expiration date. You can also stock up on your fridge and cupboard staples, such as brown rice, oats, quinoa, frozen fruit and veg, and whatever else you need. Slow cookers are great for everyone, not just those who meal prep! It can be as easy as adding your ingredients and just letting it do it’s thing. If you don’t have time to be standing over the hob or constantly checking on the cooking process then a slow cooker would be a great investment. However, not everyone has a slow cooker. In that case, roasting or baking your meals will allow you to cook large batches of food and you won’t have to be watching it like a hawk. Planning your meals in advance will make meal prep easier for a number of reasons. It will save you time in the supermarket because you’ll know EXACTLY what you need to pick up (just make sure to write a list and stick to it). You can also choose meals that are quick to prepare and that use some of the same ingredients. Reusable containers are handy for planning your portions in advance, they’re also better than using a traditional dish that requires cling film or foil which will only be thrown out once you’re done. Use plastic, stainless steel or glass lunch boxes and even reuse empty food jars. Instead of trying to fit in a couple of hours worth of meal prep when you’re just home from work you should plan to do this on a day that you’re off. However, if you find that you don’t have enough time on your days off to do this then consider doubling up your ingredients when making dinner. You can choose recipes you can easily double or that make large batches. This means that there’ll be plenty of leftovers that you can use over the next few days. 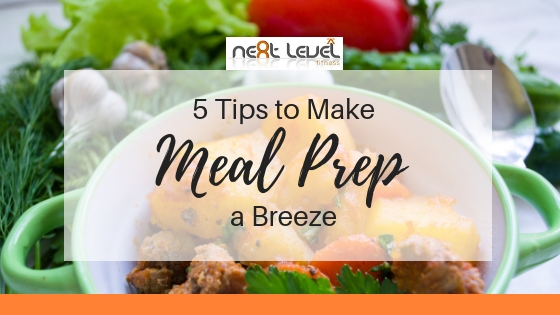 Have you got any other tips for easy meal prep? Why not share them in the comments!